EVERYONES ALL LIKE LOOK AT MY GARDEN, MADE-FROM-SCRATCH CA - ProudMummy.com the Web's Community for Mums. 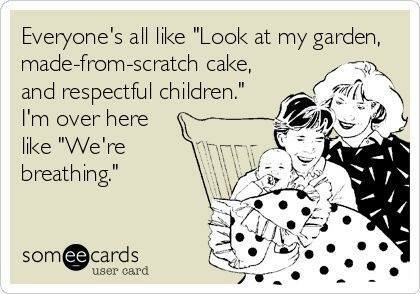 EVERYONE'S ALL LIKE "LOOK AT MY GARDEN, MADE-FROM-SCRATCH CAKE, AND RESPECTFUL CHILDREN." I'M OVER HERE LIKE "WE'RE BREATHING."